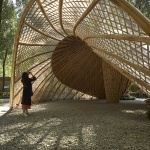 Located in a grove in the campus of BJFU, the “pavilion of clouds” is a bamboo structure built for 2018 “Bamboo Garden Festival”, and the project was commissioned by the faculty of BJFU. 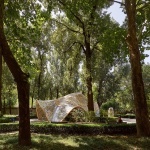 Covering an area of approximately 120 square meters, the pavilion will serve as a hub for information during the festival, and turn into a flexible place for recreation and gathering when the event is over. Bordering campus roads on its north and west, the site is a spiral square enclosed by groves, bushes, memorial stone carvings and benches, and the pavilion is situated in the center of the square. We were granted with great flexibility for the design, as the surroundings of the site posed few restrictions to the design. 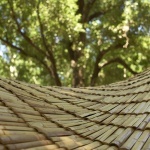 As a result, our design process started with the feature of bamboo itself. 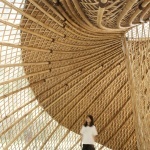 As one of the most suitable structural materials, bamboo has even more distinctive features than wood. With excellent bending resistance and tensile resistance, raw bamboo is easy to be bent or processed. With the help of modern bamboo processing technology, controllable sizing and processing of bamboo can be done in factories or even on site. 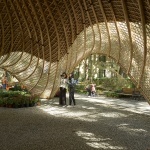 Besides, the processed bamboo isn’t prone to deformation outdoors once it is dried and shaped. 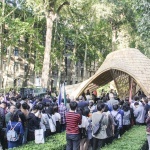 The favorable site conditions and the advantages of bamboo granted us with the possibility of a free and relaxed form with a sense of strength, which complied with both the style of the campus and the atmosphere of the garden festival. 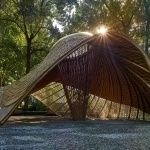 A famous verse in an ancient Chinese poem says, “A gale has risen and is sweeping the clouds across the sky.” Inspired by this verse, the design team intended to present the image of rising wind and flying clouds with the pavilion’s form. 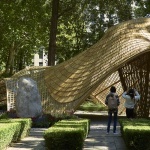 In the design process, where raw bamboo construction methods were integrated with modern building technologies, a conceptual design was made first, and the overall structure was generated through digital simulation. Those digital documents could also be used for on-site construction. 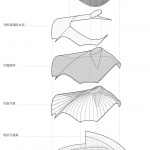 Compared with the traditional simulation method of making a small physical model, our approach had several advantages. On one hand, digitalization was applied to the whole design & construction process. Bamboo parts were prefabricated in factories where shaping and bending were done under controllable conditions, and then assembled on site. 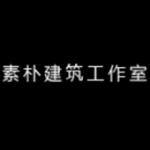 In this way, the conceptual design was implemented precisely. 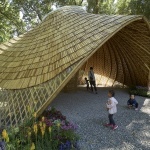 On the other hand, with the help of digital technology, the curved envelope and the curve of key bamboo beams were made more compliant with the stress situation of the structure and construction conventions. 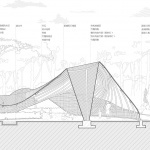 In accordance with the directions of surrounding roads, as well as the positions of trees, bushes and memorial stones, several openings at various heights were made on the pavilion, so that passengers can go through the pavilion from different routes. 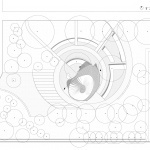 The existing bushes were preserved and extended to the interior space of the pavilion, and the upper part of the pavilion narrowed into a round skylight. 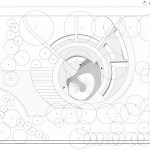 As a result, sunlight, wind and vegetation were brought into the space, making it free from sense of oppression while presenting an image of swirling clouds. 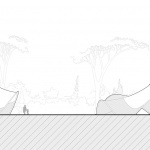 In the design process, digital models were integrated with our conceptual design. Then, after consultation with structural engineers and bamboo contractors on construction approaches & procedures, the digital model of key building parts were generated step by step. 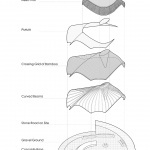 First, the positions and forms of fundamental curves of the pavilion, including its openings on various directions and the skylight, were input to generate the curved roof and the central cone. 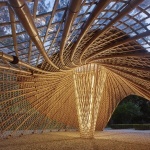 Then, on the basis of beam spacing estimated from experience, all the curved beams were generated, over which a crossing grid of bamboo split was laid, integrating all the structural parts of the roof into a whole. 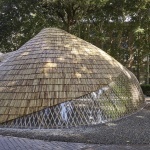 Finally, considering the demand for daylight and rain-proofing, we selected bamboo tile and PMMA as roof materials, which could both meet the demand and be applied to curved structures. Then the positioning of the curves was completed. 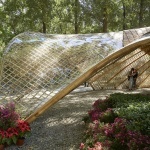 Raw bamboo has long been used on structures of buildings and bridges, especially in South China which abounds in bamboo. 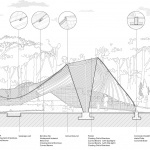 Without precise structural calculation before construction, the empirical estimation made by the bamboo contractor and structural engineers could still meet the demand of construction. 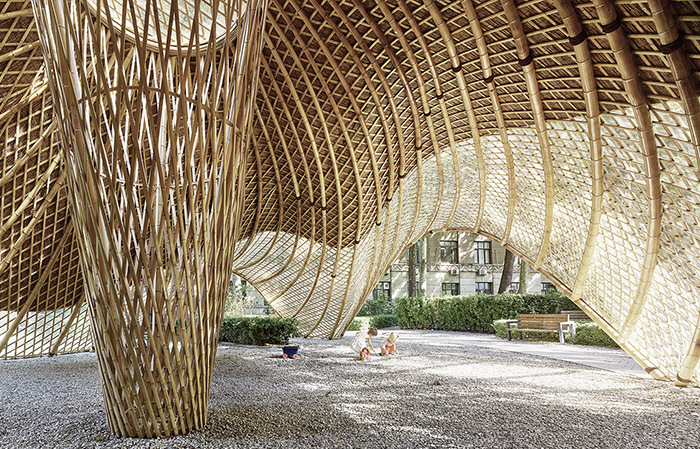 The pavilion’s shape, size, structural form and details were all determined by the bamboo contractor and engineers through collaboration. 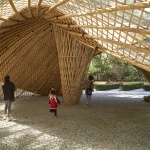 Bamboo beams, the parameters of which were determined by digital simulation, were prefabricated and numbered in the factory, and then assembled on site. 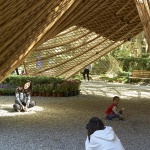 The bamboo beam and the ground were connected by metal fittings and strip foundation of cast-in-place concrete. Beams of different directions were connected in traditional ways of bamboo construction. 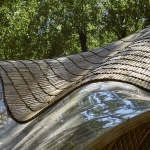 Considering the need of natural light, rain-proofing, as well as the intention to create an atmosphere of intimacy with the partly curved roof, we selected bamboo tile and PMMA as roof materials with waterproof membrane and reed mats underneath. 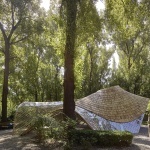 The pavilion’s central cone was not only a supporting structure, but also a channel for daylight and artificial light. 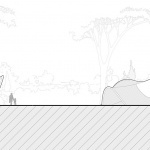 Sloped paving of permeable gravels on the site, together with pebble seepage pits dotted around the site, could avoid ponding at the joints where bamboo beams and the ground meet. 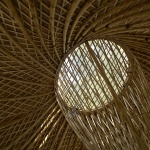 In the design process where raw bamboo building techniques were combined with modern technologies, there was a certain level of error tolerance for detailed design, which was different from the precise production of prefabricated wood and steel structure. 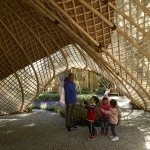 Bamboo splits and tiles made it possible to make adjustments on site, rectifying small errors by the processing of raw bamboo. 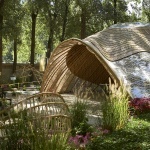 In this way, the handicraft features of the pavilion were also preserved. 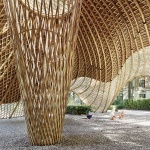 By going through the construction logic of the project, we hope that our practice has not only presented a pavilion of clouds, but also explored a feasible prototype that adapts to current conditions, and can be modified for application to different sites thanks to the great flexibility of bamboo design.